Is Your Dog Affecting Your Quality of Sleep – In a Good Way? For many dog lovers, as the snowflakes begin to fall and the temperatures outside reach gelid lows, few things appeal more than snuggling up to our beloved pooch, ‘naughtily’ allowing the little gremlin to burrow under the blanket on occasion. There seems to be plenty of conflicting information when it comes to allowing access to bedrooms for dogs; on the one hand, we know that having pets can actually help keep allergies at bay and boost children’s immunity. Pets also wield important benefits to our mental health. On other hand, it is not uncommon to read warnings about the ‘dangers’ of allowing our dogs to get too close. Early studies (such as one Mayo Clinic study carried out in 2002) found that of 300 people surveyed, 60% had pets who slept in the bedroom; in the latter group, there was a 57% chance that the dog would sleep on the bed. The study found that 53% of participants had sleep disruptions caused by movement in the bed, pets snoring, and whimpering. 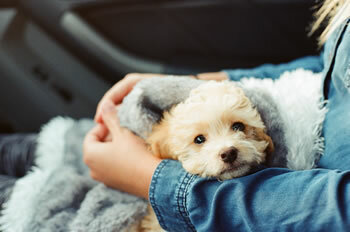 In 2012, the Mayo Clinic repeated this survey, finding that around 20% of those who slept with a pet in their bedroom or bed said their sleep was disturbed by their pets. However, 41% felt that their pets helped them sleep better. This just in . . . Dogs are more sociable than cats – Maggie could have told you that. Read the sciencedaily.com news report that proves our point! 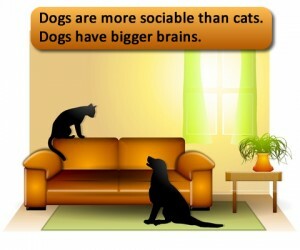 Dogs have bigger brains than cats because they are more sociable, research finds.